She strikes the Pole in her killer stilettos. She shakes, she undulates a libidinal mechanic column. “I just don’t know what to do with myself”. Pole dance exists both in the world of art and the red light milieu. The Filipina Eisa Jocson uses this acrobatic act of extreme femininity and seduction to question the formability of social and cultural constructs. In her performance, which she regards as a visual statement in space, sexuality and strength, voyeurism and restraint, and vulnerability and violation all collide. 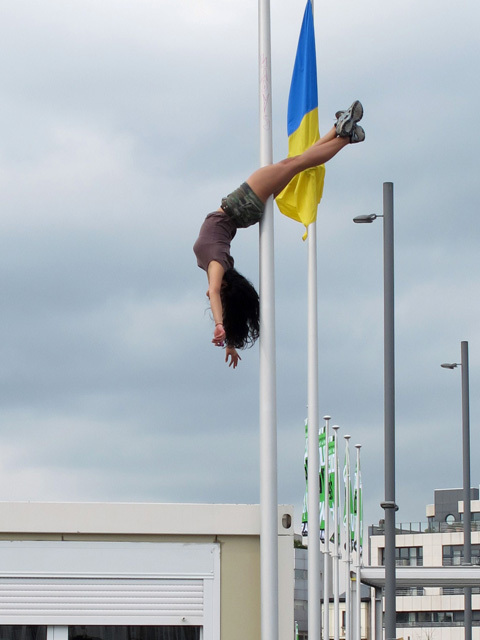 The visual artist Jocson sees the act of highlighting the pole dance in a publicly visible context as a way of playing with spectators’ expectations and encouraging them to reflect on their concepts of public and private space.